Cruise the rivers of Osaka! See the city from the waterways! 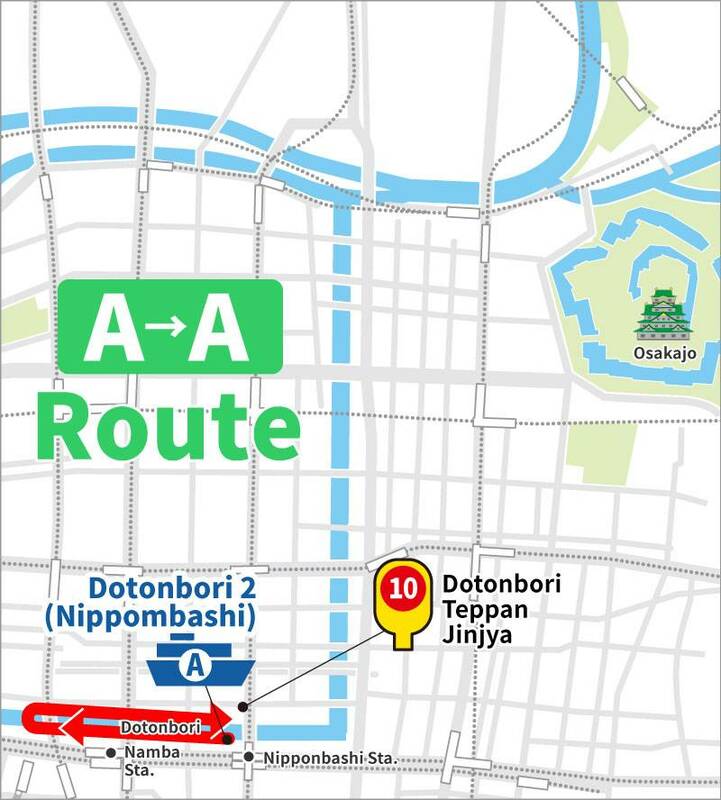 The Dotonbori 2 Wonder Cruise boarding point is about 2-3 minutes walk from bus stop 13 Dotonbori Teppan-Jinya and here you can visit DOTON PLAZA for tax free shopping or take a stroll along Dotonbori shopping street and river. Points how to find the Dotonbori 2 cruise stop -If you are standing in front of the Glico man sign and facing the sign, turn to your left and walk along the river on the same side as the Glico Man sign. The cruise stop is about 5 min walk away. 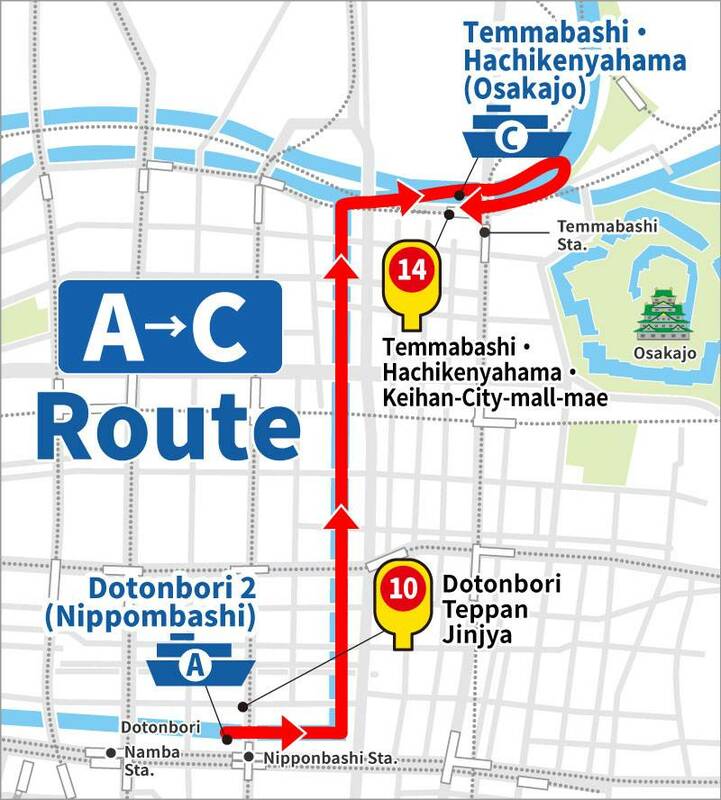 Including the bridge next to the Glico man (Ebisu bridge) you will walk under three bridges and just before you reach bridge four (Nihonbashi bridge), there is the Dotonbori 2 cruise stop. Unfortunately we are not allowed to put up a sign there, it is just a small gate with a padlock, but the boat will always stop to check for passengers. If you take the subway here, get off at Nippombashi Station (S17/K17) on the Sennichi (pink) or Sakaisuji (brown) subway lines. Cruise at the heart of Osaka and get a front row seat for the ultimate Osaka selfie with the famous Glico running man light sign right behind you. 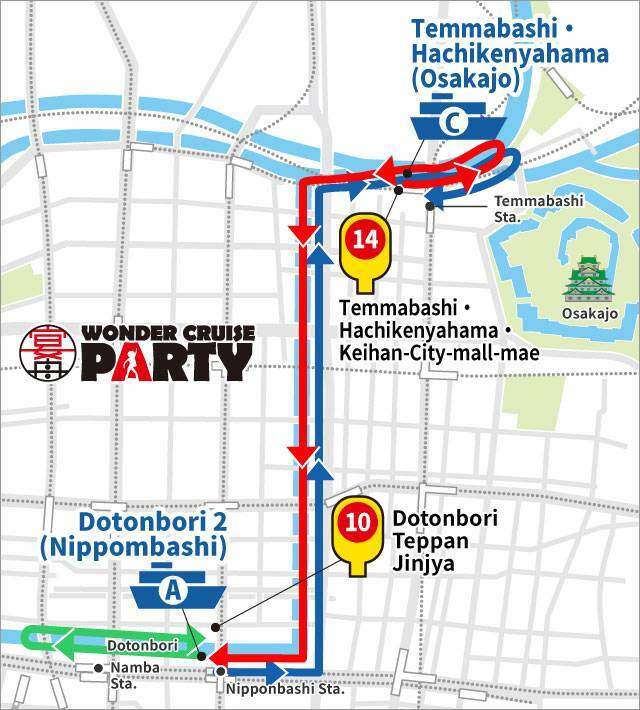 This 20min cruise starts and stops at the same spot in Dotonbori, near Nippombashi bridge. Board the boat at Dotonbori and cruise up the canal, through the water lock and onto Okawa river. Get a glimpse of Osaka Castle and the cherry tree lined river banks around Temmabashi. Start at Temmabashi and go under Temmabashi bridge to get a glimpse of Osaka Castle before down the canal through the water lock and under some of the oldest bridges in the city. This cruise finishes at Dotonbori near the bustling shopping streets and restaurants areas. Child fare (age 6-11) available on the bus! Buy your tickets on the bus or online! Buy your tickets on the bus, boat or online! Buy your tickets on the bus! Child fare (age 6-11) available! Buy your tickets on the bus or boat! Maximum capacity 60 people. We have the right to refuse boarding when the boat is full. Child of 12 years old or under must wear a lifejacket under cruising law. Make sure to check our website for cruising schedule. The cruise will cancel during to weather conditions such as strong wind, rain etc. Pleae be seated during departure until the captain gives permission to stand. Fore deck is not allowed during berthing and departure. Watch your step when boarding the boat and getting off. Water level may cause large steps between the boat and wharfs. When cruising under low bridges please watch your head if standing up. Regulation for berthing is 10 min. Be punctual before boarding the boat. During all times, the boat captain has authority to reject customer who may interfere.